I had some fresh cranberries that needed to be used up, and some leftover lemon curd – which probably would have otherwise been eaten straight from the fridge by the spoonful. Instead, I tried a recipe for Cranberry Scones. They were really easy, and delicious! 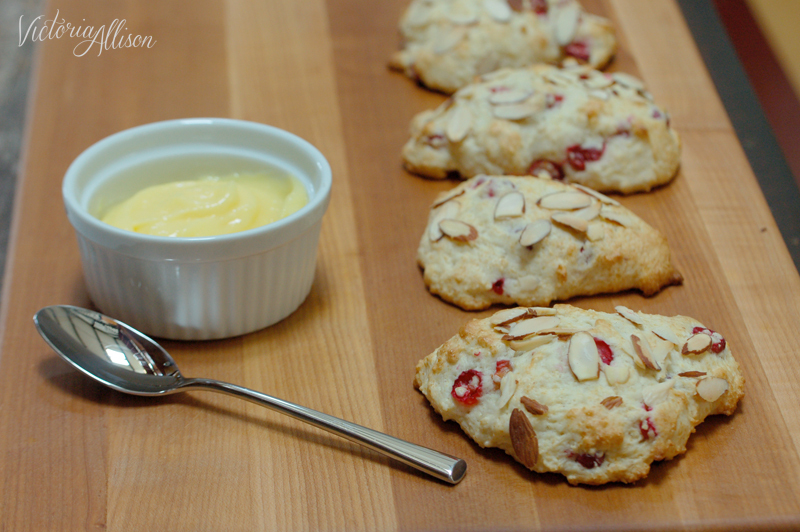 The perfect mix of tart cranberries, savory almonds, and sweet lemon curd. I’m not certain if there’s a recommended serving size, but I just loaded it up by the spoonfull(s). I’ll definitely be making these again! Preheat oven to 400 degrees F (205 degrees C) and place rack in middle of oven. Butter or line a baking sheet with parchment paper. In a large bowl, whisk together the flour, sugar, baking powder and salt. Cut the butter into small pieces and blend into the flour mixture with a pastry blender or two knives. The mixture should look like coarse crumbs. Gently stir in the cranberries and mixed fruit, making sure not to crush the berries. Add the milk and stir until just combined. Do not over mix. Transfer to a lightly floured surface and knead the dough four or five times and then pat, or roll, the dough into a circle that is 7 inches (18 cm) round and about 1 1/2 inches (3.75 cm) thick. Cut this circle into 8 triangular sections. Transfer to the prepared baking sheet and then brush the top of the scones with milk or cream. Sprinkle with sliced almonds. Bake for about 15 – 20 minutes or until lightly browned and a toothpick inserted into the center of a scone comes out clean. Remove from oven and place on a wire rack to cool. If desired, serve with Devon cream and/or your favorite jam. 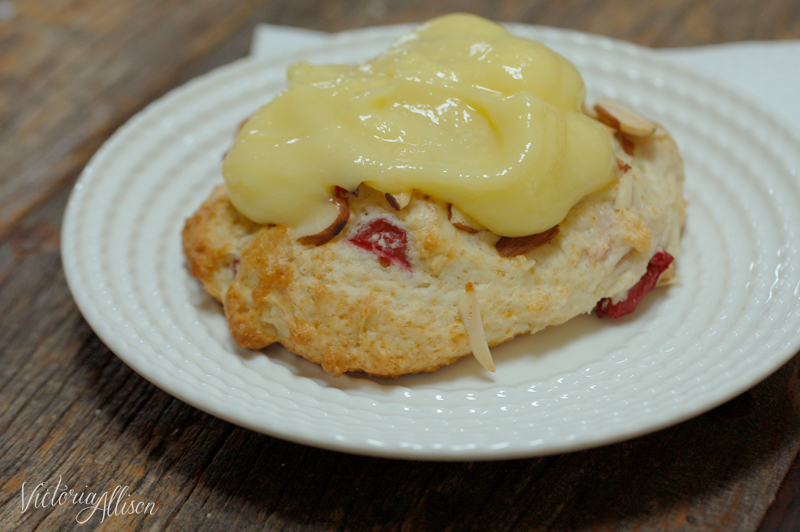 This entry was posted in Recipes and tagged almond, baked goods, baking, breakfast, brunch recipes, cranberry, cranberry lemon, cranberry recipes, cranberry scones, fall baking, fresh cranberries, lemon, lemon curd, lemon recipes, quick and easy, scones. Bookmark the permalink.